Bay County numbers show 1,190 foreclosures from January through July 2008, compared to 1,497 over the same period this year, county records show. That’s about a 26-percent increase. The numbers are even more dramatic when comparing 2007 to 2008, when the foreclosure rate jumped by 85 percent. 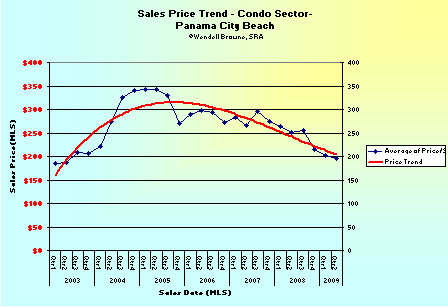 As noted from the chart below, current trends in the condo sector of Panama City Beach continue to correct and will likely continue based on the foreclosure rate within the area.